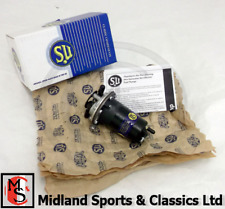 Su Aua4080 Genuine 12v Fuel Pump For Land Rover Series 1 the item is new old stock and was purchased for a 2.0 litre series 1 Land Rover but it will fit other vehicles. Any further questions please feel free to message me thanks. 12 VOLTS Hi Pressure S.U Fuel Pump. tested and in good working order. Fitted with a condenser /capacitor so is suitable for negative and positive earthed vehicles. DUAL POLARITY . Jaguar E Type 4.2 1966-71. 12v. 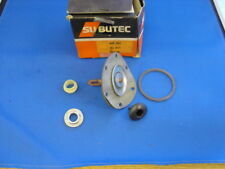 S.U Fuel/petrol pump (AUF 204) hi pressure push pump Classic mk1 Mini etc..
Hi pressure. S.U Fuel pump. (AUF 204) as fitted to Mk1 Minis &coopers Austin/Wolseley Hornet/Riley Elf /Morris1100 "etc etc. " DUAL POLARITY "suitable for both negative & positive earthed vehicle. 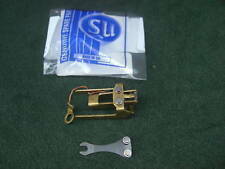 New listingL.P-12 Volts.S.U ( AUA 66 )fuel/petrol pump. "Fully Functional- Morris Minor etc. Low Pressure:S.U 12v. AUA 66 fuel pump, pull type which fits on bulkhead etc (ie can be fitted higher than the petrol tank). MORRIS MINOR / LAND ROVER SERIES 1 etc etc etc. GOOD WORKING ORDER . 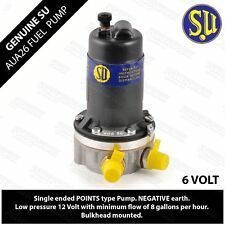 5 out of 5 stars - L.P-12 Volts.S.U ( AUA 66 )fuel/petrol pump. "Fully Functional- Morris Minor etc. 1 product rating1 product ratings - L.P-12 Volts.S.U ( AUA 66 )fuel/petrol pump. "Fully Functional- Morris Minor etc. L.P-12 Volts.S.U ( AUA 25 )fuel/petrol pump.- Morris Minor/Land/Rover series 1..
Low Pressure:S.U 12v. AUA 25 fuel pump, pull type which fits on bulkhead etc (ie can be fitted higher than the petrol tank). 'good working order. MORRIS MINOR / LAND ROVER SERIES 1 etc etc etc. SU FUEL PUMP. IN USED AS FOUND CONDITION. (my ref number 193033). SU FUEL PUMP. NOT BEEN TESTED. (my ref number 193028). High Pressure. 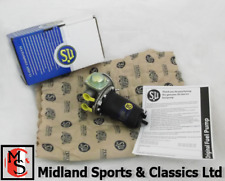 S.U FUEL PUMP MGA & MGB 1962-64 AZX1331. will also fit many other models from this era, FULLY FUNCTIONAL. From a garage clearance an SU 12v electric fuel pump type AUF201. 12v. 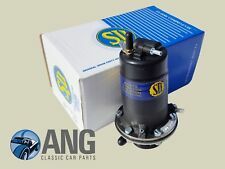 S.U Fuel/petrol pump (AUF 214) hi pressure push pump Classic mk1 Mini etc..
Hi pressure. S.U Fuel pump. (AUF 214) as fitted to Mk1 Minis &coopers Austin/Wolseley Hornet/Riley Elf /Morris1100 "etc etc. " DUAL POLARITY "suitable for both negative & positive earthed vehicle. Part no AUB6025. Electric Fuel Pump Diaphragm. Suits pump models AUF300, AZX1300 & AUF200. All manufacturer’s part numbers are used for reference only. A new and unused SU AUA25 fuel pump. Obtained for a rebuild, but never used. This pump is as received, new, from Burlen and has never been fitted to a vehicle. Original Part Number:- AZX1307. MGB MGC & V8. Suitable For:- All MGB, MGC & V8 models from 1968 on. Genuine Negative Earth SU Fuel Pump. 6volts S.U fuel pump Low pressure (AUA 26) Morris 8 1933-47 Austin 7etc etc. 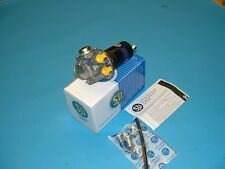 New SU AZX 1500 Negative earth double ended fuel pump. New Jaguar E type Series 1, Series 2 Triple SU inlet Manifold, fully polished complete with studs. (AUA 50) as fitted to the:1947-62 -3 Litre Rover P5 - ,1953 - 56 Austin Healey 4 & 6 cylinder models ,-1952-59. tested and in good working order. Fitted with a condenser /capacitor so is suitable for negative and positive earthed vehicles. PUMP IS ALL COMPLETE BUT UNTESTED. Jaguar Mk10 (1961-1970). Jaguar Mk2 (1959-1967). Specialising in Austin-Healey, Classic Mini, Jaguar, Mazda MX-5, MG, Morris & Triumph. Electronic fuel pump, negative earth only. PART NUMBER: AZX1308. A new OEM specification electric fuel pump for Land Rover Series 1 models from 1948 to 1958 with petrol engines. Channel Islands Available in the Glasgow Area. Northern Ireland - AB31-AB56, IV40, IV54, IV63, KW1 - KW14 INC Orkney Islands, PA21 - PA38, PH4 - PH50, HS1 - HS9, All Western Isles, IV41 - IV51, IV55, IV56 SKYE, KA27, KA28, KW17, PA20, PA41 - PA78 Inc Shetlands, Isle of Scilly, Guernsey, Isle of Man, Isle of Wight. Original Part Number:- AUF214. Suitable For:- All 1098 and 1275 Negative earth MG Midget and Austin Healey Sprites models from 1964-1974. MG Midget & Austin Healey Sprite. SU Electronic Fuel Pump. Recently removed from Bentley S1 1958 in full working order. My Bentley has been re-wired (from positive to earth) to negative/earth. PART NUMBER: AZX1307. 12 Volt, 35 GPH, Genuine SU Electric Fuel Pump, suitable for: MGB/GT 1968-1980, MGB/GT 1973-1976, MGC/GT 1967,1969. MPN = AZX1307. PART NUMBER: AZX1307. Model = MGB. About Moss…. MGA 1500CC, 1600CC, 1600CC Mk2. Polarity = Dual polarity. Year = 1953 - 1964. About Moss…. Specialising in Austin-Healey, Classic Mini, Jaguar, Mazda MX-5, MG, Morris & Triumph. Made by Fuel Miser / FuelMiser. I have quoted Fuel Miser part number as FPE-100. then it is probably right (does it look like your old pump ???). There is nothing to suggest any other date. Electric Fuel/Petrol Pump - 12V [ ve or -ve earth ]. TAKEN FROM A ROVER P4 CAR, WILL FIT MANY OTHERS INCLUDING ROVER P5 3LTR. HERE WE HAVE A GOOD TESTED SU FUEL PUMP. IT IS A HIGH PRESSURE TYPE. Genuine burlen fuels su fuel pump part no azx1307 and covering azx1318. Will fit all mgbs ,mgc and v8. Pump is a pushing type pump ie lives at the rear of the car by the fuel tank. Standard points type operation. Ftted many classsic cars; MGB, MGBGT, Morris, Mini, Austin, Jaguar, Hillman, Triumph. SU Fuel Pump Points. Part No:AUB6106. Original Part Number:- AUF214, AUF214EN. Suitable For:- All 1098 and 1275 Negative earth MG Midget and Austin Healey Sprites models from 1964-1974. MG Midget & Austin Healey Sprite. SU Electronic Fuel Pump.